There is a 6 minute short in the Futurama episode Anthology of Interest II in which the character Fry uses his video game skills to fight an alien invasion. Replace Fry with the less likable Zack Lightman and pad it out to 355 pages and you have Armada. The story borrows heavily from The Last Starfighter, Ender’s Game, and Contact. The author lampshades this by having the main character point out the similarities. Without spoilers, the ending feels like the ending of an average original series Star Trek episode. The novel is not terrible, it has some decent twists, but it is disappointing. In Cline’s debut novel Ready Player One the main character is a teenage boy who uses his knowledge of 80’s trivia and video games to win a contest and become the richest and most famous man in the world and find true love. 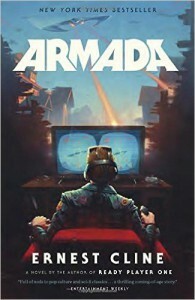 In Armada a teenage boy uses his knowledge of video games to save the world, become famous and find true love. It feels like Cline’s only storytelling move is nerd wish fulfillment in which an obsession with video games turns out to be extremely useful instead of completely useless and brings the nerd wealth, power, respect, fame, and love. All things missing from the life of the average video gamer. I find myself wondering if Armada might have worked better if it had been the sequel to Ready Player One. Wade Watts discovers that while the human race parties in the virtual reality Oasis, an actual alien armada is preparing to attack the Earth. He considers deactivating the Oasis to awaken humanity to the threat, but instead launches a new game in which the players are unknowingly piloting real drones to fight real invaders. Maybe Zack uncovers the conspiracy and reveals to the world that the invasion is real. Maybe that is exactly what Wade hoped would happen and he ends up selecting Zack as his successor. The similarities between the works become a strength because it is a continuation of the story. We tend to think of sarcasm as a modern affliction, but Charles Mackay's writing is as sarcastic as anything I have ever read. 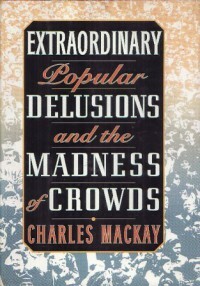 Extraordinary Popular Delusions is a 700 page study of what Mackay calls the Madness of Europe, up until 1841. The book is divided into long and short sections, depending on how exhaustively the author wanted to explore a given topic. Some of the long sections include financial bubbles, alchemy, the Crusades, and witch hunting frenzies. Shorter sections cover various types of medical quackery, doomsday prophets, poisoners, and dueling. Every now and then Mackay pauses to praise his own age as having put such outbreaks of public madness as the Crusades and witch trials behind them. Of course Mackay did not live to see two World Wars nearly destroy Europe. As far as witch trials, it was only a few years ago that the recovered memory fad led to accusations as insane as any ever made by a witch hunter. Financial bubbles will continue as long as people are willing to risk their life savings on investments that they do not understand and are designed not to be understood. And while alchemy may be largely forgotten, modern day New Age gurus and televangelists will continue to exploit greed and fear of death in the never ending dance of the gullible and the fraud. I bought a copy of this book at least 25 years ago for the title alone and it sat on my shelf unread until now. Not a lot of 19th century non-fiction gets read these days, mostly because the value of non-fiction tends to diminish the more out of date it becomes. Also because 19th century books tend to be very long and dense in comparison to modern books. Mackay's topic is unfortunately timeless and his sarcastic tone is very readable. If you try the book and get bogged down in the details of 18th century investment ripoffs, you might try skipping ahead to the Crusades and the witch mania which is more engaging. 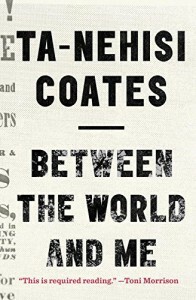 Between the World and Me has been praised and criticized by many many reviewers, so I will limit myself to a couple of textual elements that struck me as odd. Coates has some unusual rhetorical devices that take a little getting used to. He constantly refers to "black bodies" in such a way that I assumed he was building to some sort of dualist worldview in which oppressors could break or destroy bodies but could not steal minds or spirits. Instead he makes it clear that he is a materialist who does not believe that there is any part of an individual other than the physical body. If people are nothing more than bodies then discussing the body as if it was a thing apart from the person is an odd argument. He may be arguing that American society devalues black people down to nothing but bodies, or it may be the imbalance of power requires black people to struggle to preserve their bodies on a fundamental level of basic survival. Coates often refers to white Americans as "Dreamers." He means this contemptuously, implying that white people live in a fantasy world of security and opportunity while deliberately ignoring the historic crimes on which American society is built. This is also an odd rhetorical device considering every since Martin Luther King's historic "I Have a Dream" speech, references to "The Dream" have been a staple of the Civil Rights Movement. It is surprising to see the term turned around and applied to whites as a term of derision. Neither of these observations are intended as criticisms of the book as a whole or its author's message. They are just a couple of textual factors I found interesting. All Systems Red is a first person narration by a "Murderbot," which is the narrator's term for itself and its fellow security robots. SecUnits are a mix of combat robotics with cloned human parts that make it more of a cyborg than a robot, although the term is never used. The narrator is unique in that it has managed to hack its governor unit, giving it the ability to disregard orders, an ability that it keeps a careful secret because its discovery would likely lead to a complete mind wipe or even destruction. The story has gotten a lot of praise and won some genre awards, which I found a bit surprising at first because the tone of the story is actually rather old fashion SF. There is nothing about the plot or narration that would seem out of place in an old issue of Astounding Science Fiction from the John W. Campbell days. In that though is the secret of the story's subtle brilliance. The narrator is a sentient being that wants to do its job with as little human interaction as possible. The bot is not an emotionless logical cliche, it has a full range of emotions with the exception of anything related to sexuality as it is asexual by design. The bot is capable of anxiety, annoyance, and protectiveness; if anything it comes across a bit tsundere. High functioning Asperger's was the term that kept popping into my head while reading it. Which brings me back to the connection to old school SF. A lot of older Science Fiction from the era of the pulp magazines reads like it was written by and for high functioning Asperger's cases. The focus is on setting and problem solving, not on character development or interpersonal relationships. The characters display limited emotional range and any romantic elements are strictly background and never central to the plot. I think this is why to this day SF is often dismissed by critics and scholars as boy's literature with limited appeal for women. Of course this stereotype was never really true and is even less so today when there are many successfully women SF authors. 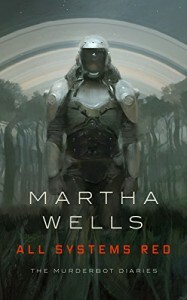 I may be reading something into the text that the author did not intend, but it seems to be that Martha Wells is looking back at old school SF and adding a bit of psychological subtext to its cerebral focus. There is also another level you can take this to and that is that Murderbot is essentially a slave. No matter how kindly or benevolent its "clients" are they are still buying and selling it for its capacity to work. Legally it is inventory and even if its owners are friendly they are still its owners. Murderbot rejects overtures of friendship because the only way it can be free is through escape, either through mental isolation or physical separation. “Such a reading is not for you. Read the books of your home. The great epic of Finland. I read one page, I read two pages. Old man of calm waters. “I have spotted a fraud! I read 67 pages and gave up. Then I downloaded the book from Audible. So an audio book seemed appropriate. 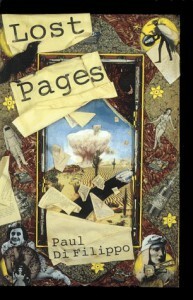 Lost Pages is a collection of short stories linked by the conceit of taking famous 20th century authors and placing them into different historical contexts. Not different time periods, just very different situations in their own time. It is essentially nine alternate history stories, each with a famous writer as the main character. I would love to spoil them all because the premises are very clever, but I will limit myself to a couple. The story that may be the best in the collection, but also the most dubious, has Anne Frank escape the Holocaust and still write her famous diary but instead it is about her rise to stardom in Hollywood. In another story Antoine de Saint-Exupery is one of the last survivors after most of humanity is wiped out by a plague and he attempts to rebuild civilization based on air power. Some of the stories are more science fictional than others and several of them featured authors who were SF writers. There is no continuity running through the stories, each exists in its own world. There are some dark twists, but over all the stories are a lot of fun. 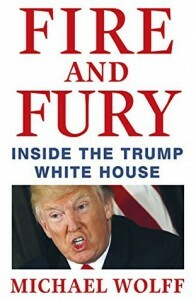 The biggest surprise in this book for me was that the book is more about Steve Bannon than Donald Trump. Wolff opens and closes the book looking at Bannon, who clearly sees himself as the true leader of the far-right nationalist movement. Of course when the book was completed neither the author nor Bannon could foresee how badly Bannon's supported candidates would flame-out in the mid-term election. Bannon made himself completely toxic within the Republican party and one of the biggest factors was this book. The detail of the reportage of meetings and private dinners that Bannon attended reveal that he was one of Wolff's primary sources and probably his biggest source. Like Trump, Bannon cannot resist boasting, taking credit for all successes, passing the blame for all failures, and generally drawing attention to himself. He could not have more perfectly shot himself in the foot with Trump's devoted cult of personality. Like Trump, Bannon always assumes he is the smartest man in the room, but considering the White House he worked for that is a pretty low bar for which to strive. Circe is best known as the witch from the Odyssey who turns men into pigs, but thanks to the complex genealogies of Greek mythological characters Circe is related to dozens of other stories. 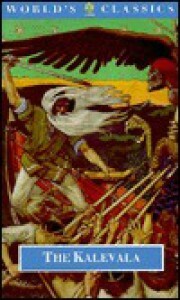 Miller picks and chooses among the myths in order to tell a coming-of-age story in which the protagonist requires hundreds of years to come-of-age. The novel belongs to the modern sub-genre in which a supporting character from fiction or myth gets to tell their own story and typically the villain becomes the hero or vice versa. Miller's Circe starts out as a surprisingly naive young woman who takes a lot of abuse from her family. Only in exile does she discover her own power and identity. Isolation and a history of abuse sometimes cause Circe to drift into cruelty, but she always regrets it and tries to make amends. If anything, she falls in love too easily, but the author prevents the romantic elements from driving the plot. 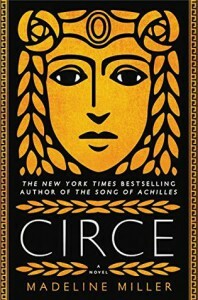 Circe is a promising debut novel, but I hope its success does not trap the author into a formula of retelling stories from mythology for a post #MeToo audience. Tom King writes superhero stories about psychological trauma, not just as a plot element but as a raison d'etra. In books like Vision and Mister Miracle the psychological trauma is the engine of the plot. In his new series Heroes in Crisis an attempt to recover from trauma leads to far greater trauma. 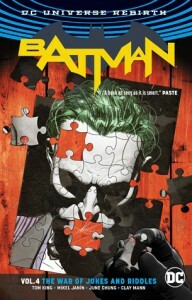 Batman: the War of Jokes and Riddles reveals a story from Batman's second year as a hero. The Joker and the Riddler go to war, not for control of Gotham City, but over who gets to kill Batman. Every name villain in Gotham gets roped into the fight on one side or the other, hundreds of civilians are killed in the crossfire, and Batman is forced to compromise his core values to try an end the war. Despite the death toll, in places it reads like an homage to the old Batman TV series from 1966, with Batman trading punches with bad guys with "POW" sound effects. In the end Batman is so traumatized he feels like his whole incorruptible persona is a sham. Oh, and it is the origin story of Kite Man. 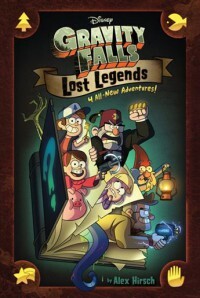 Alex Hirsch, the creator of the Gravity Falls TV series, wrote all four stories in this graphic novel. It feels like a glimpse of some episodes we might have seen if another season had been produced before the series finale. Ambitious and abandoned is how I would describe this graphic novel. 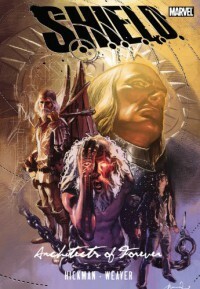 The premise of this short-lived Marvel series was that S.H.I.E.L.D., the spy organization founded after WWII to hunt down Communists and other insurgents, is actually a ancient secret society which has defended the Earth from alien threats since at least 2620 BC. Every famous scientist, artist, or mystic you can think of was a member, including Da Vinci, Galileo, Isaac Newton, Nostradamus, and Nikola Tesla. More modern members include Howard Stark, the father of Tony (Iron Man) Stark, and Nathaniel Richards, the father of Reed (Mr. Fantastic) Richards. The plot jumps all around and throws in all manner of twists including a war between immortals Newton and Da Vinci over the fate of humanity, a time traveling Tesla who is married to a woman who can turn into a bird (or something), a Chinese scholar named Zhang Heng who hid a baby Celestial, and lots of vague references to ominous sounding things like the Greater Science, the Hidden Arts, and the Human Machine. It all seems very promising, and Dustin Weaver's illustrations are excellent, but it appears not to have been the hit Marvel hopped it would be and the project was quietly abandoned. Hickman has occasionally dropped references to the deep history of S.H.I.E.L.D. in his other Marvel work, suggesting his has not given up on the idea, but we will probably never see a continuation of the series big enough to do justice to the scope of the premise. Bitter Angels opens when a woman suffering from severe PTSD after being tortured as a prisoner of war is called back to active service to investigate the death of her mentor by a sort of interplanetary secret service called the Guardians. The story is set in a future where medical science has achieved human immortality, but access to it is heavily restricted. It is also possible to have an AI chip implanted in your brain that provides you with lifelong companion that only you can see and hear. It is a future where colony world populations exist as indentured slaves working to pay off debts for water and air that can never be paid off. 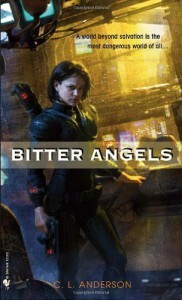 The plot of Bitter Angels involves a series of extremely byzantine plots and the main characters' attempts to unravel them while be continuously manipulated by the powers trying to keep their secrets. I cannot attempt to describe the plot without spoiling it, but suffice to say it is genuinely interesting and kept me guessing right up to the last chapters. 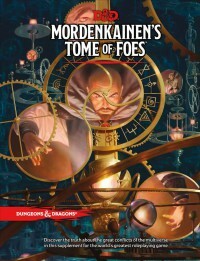 Mordenkainen's is a D&D supplement book organized into chapters based on pairs of related opposites. The idea here is that Modenkainen, who was a wizard character played by Gary Gygax himself, was not a champion of good or evil but rather of balance between the opposing forces of the multiverse. The book is very heavy on flavor text, which I like, and can be used to add depth to and inspire campaigns. The first chapter deals with Devils and Demons, which are very different things in the world of D&D, and the ongoing Blood War between the lawful and chaotic factions of evil. I love the idea that Hell exists as a barrier protecting the universe against something even worse. Second is a long chapter about Elves and their evil splinter group the Drow. My main takeaway from this was that Elves have a remarkably mellow pantheon of gods who ask very little of their followers and expect to be asked for very little in return. I could get behind a religion like this. Dwarves and their evil splinter group the Duergar come next, not much new here other than the authors seem to have some sympathy for the Duergar, Next comes the Githyanki and Githzerai, the opposed factions of the Gith that travel the multiverse fighting the Mindflayers and each other. My favorite detail about the Githzerai is that they live in a city built on the corpse of a dead god floating in the Astral plane. The last of the flavor chapters is about Halflings and Gnomes. Based on what had come before I was so hoping that a massive lore change was coming in which it would be revealed that Halflings and Gnomes split off from the same race and that an ancient war was fought between the two groups. Alas, it was not to be. It appears that the authors only put the two groups together in one chapter to match the structure of the rest of the book. The second half of the book is a bestiary with some new monsters and some updates. Shadar-kai are now a subgroup of Elves, which is a change I don't care for. Elves are Fey creatures and all Fey originate in the Feywild. Shadar-kai come from the Shadowfell. I liked them better as their own category of shadowy humanoids. The update to Trolls is interesting, with variants based on environmental mutation. The Sibriex is extremely gross and could be fun to use with its warp creature ability. Several commentators have made fun of the Giff, but I like these hippopotamus based humanoids with their sort of colonial era British military motif. I also enjoyed the look at the second tier dukes of Hell, like Bael, Hutijin, and Titivilus, and their psychological motivations. TL/DR: Probably the best 5th edition supplement to date. Lincoln in the Bardo belongs to that rarest of fantasy sub-genres, novels about the society of ghosts living in a cemetery. Like Peter S. Beagle's 'A Fine and Private Place', the inhabitants of Oak Hill Cemetery are confused about their past and have some secrets. Like Neil Gaiman's 'The Graveyard Book' the ghosts are capable of cooperating and attempting to help each other. Like C. S. Lewis' 'The Great Divorce', the inhabitants linger due to their own stubbornness and refusal to face their present reality. 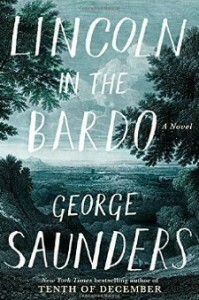 Bardo is one of the most oddly structured novels I have read, consisting entirely of first person narration by multiple characters, interspersed with brief quotes from historical books and articles about Abraham Lincoln. The plot is about the death of Lincoln's 11 year old son Willie Lincoln in 1862. The novel is a moving meditation on death and the necessity of facing the reality of death and moving on, for both the living and the dead. 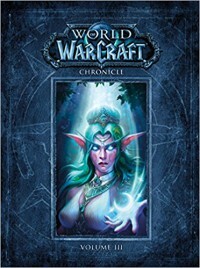 The third volume of the World of Warcraft Chronicle covers events from the Third War up to the Cataclysm. Lots of details here about Illidan, the Lich King, Thrall and others. It clears up some questions I had but had never bothered to look up, such as how so many Blood Elves ended up in Outland. Because the book is now covering events that took place in-game, the authors have to take major historical events that were preformed by players of both factions many many times in the game and present them as singular events performed by only one group. As a result some raids are attributed to the Horde and some to the Alliance, even though players of both factions do them regularly. I have to wonder if the authors flipped coins to pick between Alliance and Horde, or if they tried to find legitimate lore reasons for choosing one over the other. A new student at Griswalds Grammar has all the kids eating raw onions and repeating that he is a "right good laugh once you get to know him." It is up to Shauna Winkle to get to the bottom of the onion eating weirdness and fix this minor crisis.